This Seinheiser microphone is designed to pick up the sounds of the guitar amp, but it makes a perfect choice for when I want to milk the sounds of my acoustic guitar in a live performance. The pattern of the microphone is supercardioid and polar, and the response of the microphone is very fast. 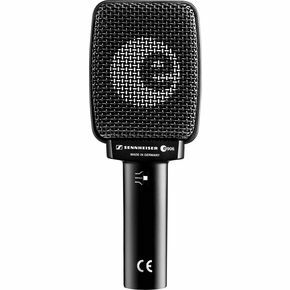 It is designed to compensate for any humming and self-noise produced, making it a great microphone to use in the studio. At nearly $200, it is far out of the price range of a poor musician like myself. But it is certainly a microphone that I will purchase when beginning to produce my music in a recording studio.